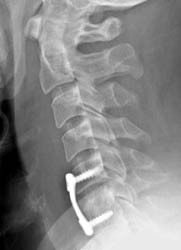 43 year old man who is status post C6-7 anterior cervical discectomy following an accident in the early 1990s. The patient did well until approximately one year ago when he was involved in another accident with recurrence of neck pain and pain down his arms. Patient complained of pain with movement and numbness and tingling in the C6 area, right greater than left, with occasional radicular pain to this area. 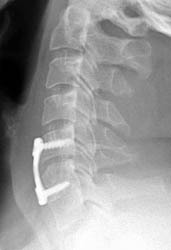 The patient underwent C5-6 anterior discectomy and interbody fusion. Lateral radiograph taken 1 day after surgery. The cortical screws and the anterior plate appear well seated. There is prevertebral soft tissue swelling, consistent with the recent surgery. Lateral radiograph taken 3 months post-operatively for a routine survey. Careful examination of the positioning of the screws relative to each other one can note that on the prior film, the screws are parallel to each other. Now, the screws converge anteriorly slightly, consistent with graft collapse.